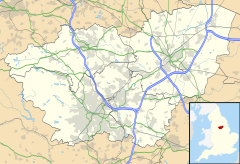 Finningley is a village and civil parish in the Metropolitan Borough of Doncaster, in South Yorkshire, England. Historically part of Nottinghamshire, Finningley lies along the A614 road, about six miles from the centre of Doncaster, at 53°29′N 0°59′W﻿ / ﻿53.483°N 0.983°W﻿ / 53.483; -0.983, and at an elevation of around 23 feet above sea level. According to the 2001 census it had a population of 1,442, increasing slightly to 1,497 at the 2011 Census. The parish church of Holy Trinity is Norman, with a 13th-century chancel. The place name Finningley contains the Old English word, fenn, a fen, a marsh, marshland + -ingas (Old English), the people of...; the people called after... + lēah (Old English), a glade, clearing; (later) a pasture, meadow... and so a "Clearing of the fen-dwellers". Finningley is known for its airport, formerly RAF Finningley. The station housed a 'V' force of Vulcan bombers during the Cold War, and for 35 years it hosted a regular air show which, by the 1990s, was the largest one-day military air show in the country. However, the end of the Cold War led to the airfield being closed in April 1996, with the air show dying with it. The 3,000-yard (2,700 m) long runway, currently the second longest in Northern England, was sufficiently large to take even Concorde, and in the period after the closure of the RAF airfield there were several campaigns to turn Finningley into a commercial airport for the unserved South Yorkshire region (as well as Nottinghamshire, Lincolnshire and the East Riding of Yorkshire). Plans for the conversion were finally approved in 2003, with the first flights in April 2005. The airport was named Robin Hood Airport Doncaster Sheffield, later renamed Doncaster Sheffield Airport. Planning permission for a new railway station to serve it was granted  – the former station serving it and the village having been closed in 1961. However, the new station has yet to be constructed. Leon Motors, a bus company located in Finningley, operates buses in Doncaster. Formed in 1922, it was taken over by MASS of North Anston during 2004. Finningley is home to a Motocross venue. ^ More about our Village – Finningley Village Community Group Retrieved 13 March 2018. ^ "Area: Finningley CP (Parish)"
^ "Civil Parish population 2011". Neighbourhood Statistics. Office for National Statistics. Retrieved 7 March 2016. ^ Pevsner, Nikolaus. 1979. The Buildings of England:Nottinghamshire. page 127. Harmondsworth, Middx. Penguin. ^ Burke, Darren (28 September 2016). "Remembering RAF Finningley 20 years after its closure". Doncaster Free Press. Retrieved 2 October 2017. Wikimedia Commons has media related to Finningley.